"I told my folks that's the man," Trump said in the Oval office Thursday. President Donald Trump said he recommended Herman Cain, a political ally and former 2012 Republican presidential candidate, for a seat on the Federal Reserve's Board of Governors. "I have recommended Herman Cain," Trump told reporters in the Oval Office Thursday. "He's a very, terrific man, terrific person. He's a friend of mine. I have recommended him highly for the Fed. I told my folks that's the man. He's doing some pre-checking now and I would imagine he would be in great shape. I find Herman to be an outstanding person. A truly outstanding individual I think he would do very well there." (Steve Pope/Getty Images) Potential GOP presidential candidate Herman Cain, the former chairman and CEO of Godfather's Pizza, speaks at the Iowa Faith & Freedom Coalition event, March 7, 2011, in Waukee, Iowa. 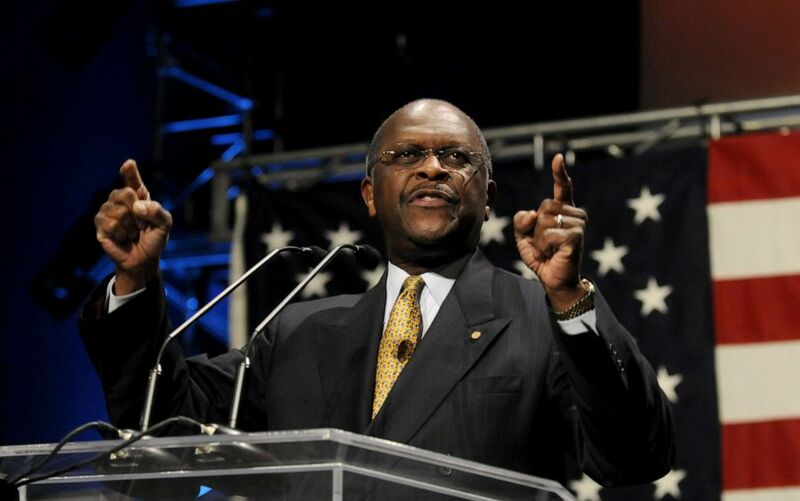 Axios reported earlier Thursday that Cain is being considered for the post. Cain, who served on the board of the Kansas City Federal Reserve, opposed now-Sen. Mitt Romney, R-Utah, in the GOP presidential primary in 2012 but dropped out of the race after allegations emerged of sexual harassment and infidelity. Before his departure from the race, Cain was known for touting his "9-9-9" tax plan to reform the current tax system. The president's newest nominee to the central bank comes shortly after he announced he plans to nominate conservative commentator and former campaign advisor Stephen Moore to the Fed. Moore previously founded the Club for Growth and served as the chief economist of the Heritage Foundation. The vocal Trump supporter since the 2016 presidential election has been a longtime critic of the Fed. Since taking office, Trump has reshaped the seven-member board, nominating four members to its ranks, including Fed chairman Jerome Powell. Over the course of his presidency, Trump has sharply criticized Powell for raising interest rates to curb inflation, blaming the chair for hurting economic growth and suggesting his decisions undermine his administration's success. "Had the Fed not mistakenly raised interest rates, especially since there is very little inflation, and had they not done the ridiculously timed quantitative tightening, the 3.0% GDP, & Stock Market, would have both been much higher & World Markets would be in a better place," the president tweeted last week. Last month, Powell said the Fed would pause planned rate increases because the U.S. economy was slowing -- and could continue to slow in part due to a prolonged Trump trade war with China. On Wednesday, White House economic advisor Larry Kudlow reinforced the president’ support for Moore, despite a New York Times report that he failed to fully pay taxes and alimony. ABC News' Alexander Mallin, John Parkinson, Katherine Faulders and Amanda Maile contributed to this report.